Tsig™ is TelcoBridges Signaling gateway family of products. TelcoBridges Tmedia™ gateways have longtime been recognized as the industry's most stable & reliable gateways available. We have taken our design and applied it to a signaling gateway solution. Introducing the most reliable & stable Signaling/SIGTRAN Gateway in the world. The TelcoBridges Tsig Signaling/SIGTRAN Gateway transfers signaling messages between Common Channel Signaling nodes (CCS) and/or between Signaling Transfer Points (STP). The Tsig signaling/SIGTRAN gateway performs packet level translation from SS7 signaling to SIGTRAN signaling. It is capable of scaling from 1x SS7 signaling link to 64x SS7 signaling links in a single unit. It can be deployed fully redundant (1+1) providing high availability (HA) of over 99.999% availability. The TSG800 is software upgradeable from 1 to 16 T1/E1's. 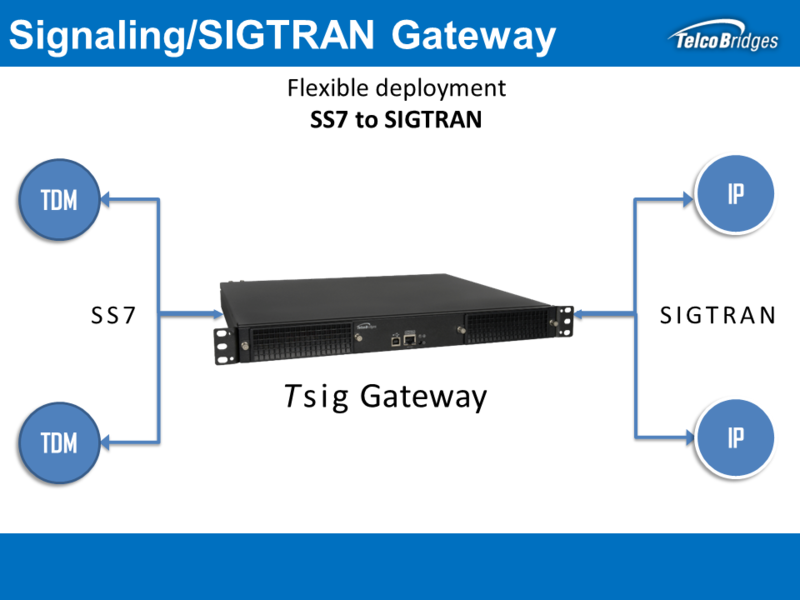 The TSG800 1U solution is the most cost effective Signaling/SIGTRAN Gateway. The TMG3200 is our workhorse Signaling gateway. Internationally recognised for its uncompromising reliability, high-capacity and high-performance, the TSG3200 is an 16 to 64 T1/E1 (or 1 to 3 DS3, or 1 OC3/STM-1) port Signaling gateway that offers the industry's highest density SS7 gateway in a single box (1U) solution. What is a Signaling Gateway or a SIGTRAN Gateway? A signaling gateway is a network component responsible for transmitting the information related to call establishment, billing, location, short messages, address conversion, and other services. The signaling gateway function can also be included within the larger operational domain of a Signal Transfer Point (STP). Some units like the TelcoBridges Tsig Signaling gateway can function either without the use of a softswitch, or with a softswitch communicating using MEGACO or H.248. Protocol conversion gateways can also convert from one network operational paradigm to another , such as, SIP to ISUP for call control, SIP to TCAP for address translation, or SIP to MAP for location or presence.